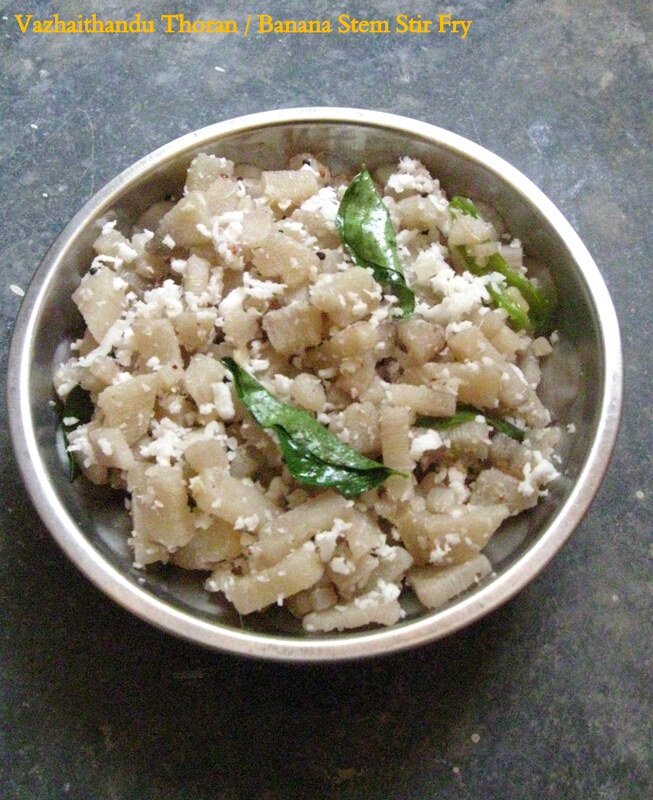 Vazhaithandu Thoran or Banana Stem stir fry is a healthy and delicious side dish for rice, sambar or rasam. Banana stem has many nutritive and health benefits. It is rich in fibre, vitamins like B6 and minerals. It is anti-diuretic, helps in the production of hemoglobin, reduces blood pressure and helps in weight loss. Though the parts of banana plant such as the banana plant stem, the flower, the raw as well as the ripe banana has been used for cooking and eating, the major problem is it is really time-consuming to prepare a dish with banana stem. I mean, the banana stem, be it any other part of banana plant, requires one to invest a lot of time in pre-preparation. That is, the outer flesh of the banana stem needs to be removed, cut into round shapes and soaked in water or buttermilk to avoid discoloration, and then it is finally cooked. But once you learn the trick to do it, then i assure you, the Vazhaithandu Thoran is easy to make and is delicious side dish for rice. Wash and soak the Toor dal in water for about 20 minutes. Cut the outer part of the banana stem and then cut into round pieces. Then finely chop the banana stem and put the chopped pieces in a bowl of water with few drops of buttermilk added to it. Just before cooking, remove the chopped banana stem from water and place it in a small pan. Allow it to steam cook (for about 10 to 15 minutes or until the banana stem is cooked) with a lid closed. This is done to avoid vaporizing away of precious minerals from the banana stem while steaming. Check whether the banana stem is cooked by placing a small piece between the fingers, and try to mash it. Once done, remove from flame and keep aside. Heat a kadai, add coconut oil and temper with ingredients given under the ‘Tempering’ table. Then put the steam cooked banana stem, add the drained and soaked toor dal, turmeric powder and salt to taste. Mix well. Cover and cook for few minutes on a medium flame until the dal and banana stem are cooked. Once done, add the grated coconut and mix well. Garnish with curry leaves and mix. Remove from flame. Healthy and tasty Vazhaithandu Thoran is ready to serve with plain rice, sambar rice or rasam saadham or curd rice. Always soak the banana stem in plain water or with a little buttermilk in water to avoid discoloration while cutting it into pieces.